In the Midwest, the chilly arrival of Halloween, Thanksgiving, and Christmas creates the perfect environment to draw the drapes and hunker down to watch some television. 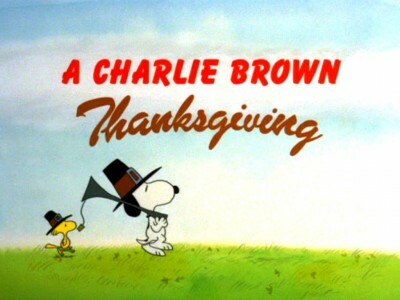 To TV lovers in my age bracket (the Punic Wars) who are rooting around for something nostalgic, triggered memories of annual CBS airings of Charlie Brown animated specials, such as A Charlie Brown Thanksgiving, are inevitable. 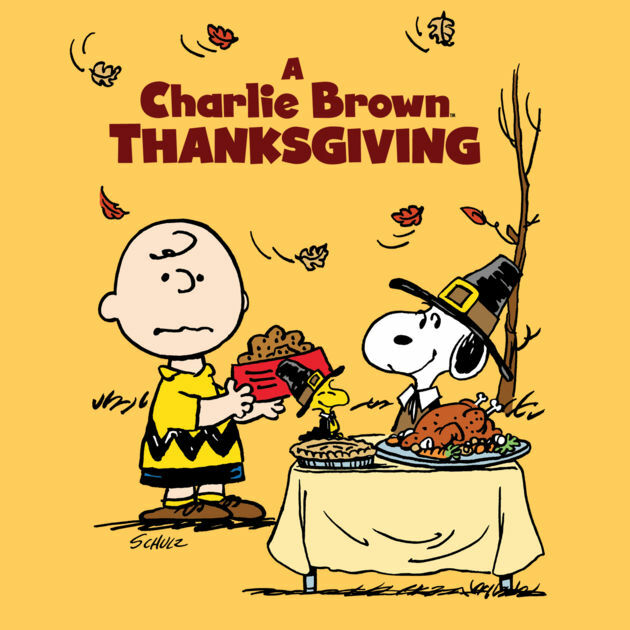 Not in the top tier of the classic Peanuts shows, A Charlie Brown Thanksgiving resembles the gold standard A Charlie Brown Christmas a little too much for its own good. There’s no denying, though, that Snoopy (as usual) makes the toon worthwhile, as does the beautiful score by Vince Guaraldi (arguably the guy who introduced more people to jazz…who didn’t know they were listening to jazz). 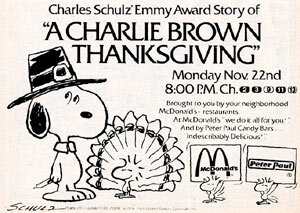 In case you’ve been living on the Moon, a very brief synopsis of A Charlie Brown Thanksgiving is in order. Charlie Brown (voice of Todd Barbee), after having humiliated himself yet again by falling for Lucy’s (voice of Robin Kohn) old football trick, looks forward to another depressing holiday: Thanksgiving. It’s bad enough about the football, but then he sees that Snoopy (voice of Bill Melendez) gets more mail than he does, and he soon discovers from his sister Sally (voice of Hilary Momberger) that the stores already have Christmas items for sale (back when people were still worried about the commercialization of our holidays). Adding to his existential troubles is the fact that Peppermint Patty (voice of Christopher DeFaria) calls up on Thanksgiving Day, and invites herself over for dinner…along with Marcie (voice of Jimmy Ahrens) and Franklin (voice of Robin Reed). But Charlie Brown’s family is headed to his grandmother’s home for the day, so it’s up to Linus (voice of Stephen Shea) to come up with a plan—with the help of Snoopy and his bird-brained pal, Woodstock (voice of Bill Melendez)—to save Charlie’s holiday. After countless repeat viewings, what primarily interests me now with these Charlie Brown TV specials is my own nostalgia factor, weighed against the reaction of my kids to these perennial favorites. Anyone growing up in the late 60s, early 70s remembers what a comparative “wasteland” prime-time network TV was for kid-specific animation fare. You had the groundbreaking The Flintstones and a few other prime-time cartoon series here and there, but overall, before cable, VCRs, DVDs and internet streaming provided 24-hour-a-day access to toons, it was a relatively rare event to see a cartoon on prime-time network TV. 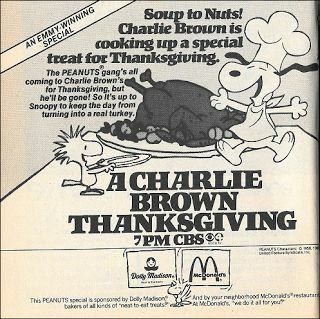 Saturday mornings were it, but holidays were a good bet, too, and certainly the Peanuts specials took on an almost quasi-religious aspect for most kids’ “must-see” TV schedules. Nobody missed a Peanuts special. Today, of course, with a myriad of media options, it’s difficult if not impossible to ratchet up that kind of viewer consensus for any TV show, as recent skimpy ratings for ABC’s repeats of Peanuts specials bears out (and sorry—they just don’t feel the same coming out of the now-wretched Mouse House). While today’s parents who grew up during that original Peanuts era probably still view the specials as de rigueur holiday experiences, they’re more likely to pop in a disc or search Hulu than sit through the edited, commercial-laden network broadcasts. My kids are no different. I don’t think we’ve ever watched the classic Peanuts specials on network TV; it’s always been video or disc (you want me to watch them on TV again? Put back the vintage Dolly Madison commercials and I’m in). 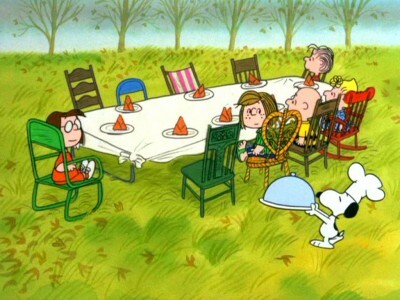 Which brings us to A Charlie Brown Thanksgiving. First aired on November 20, 1973, when Charles Schulz’s strip comic was at the apex of its cultural saturation, the short is now widely regarded as one of the “Big Three” of the classic Peanuts specials. And while A Charlie Brown Thanksgiving isn’t the equal of either the superlative A Charlie Brown Christmas or It’s the Great Pumpkin, Charlie Brown (nor even the underrated Be My Valentine, Charlie Brown), it’s relatively amusing, while conveying enough of the “Schulz touch” to be recognizable as one of the “classic” outings with the Peanuts gang. A Charlie Brown Thanksgiving‘s biggest problem is familiarity: it’s structured too closely along the lines of the better A Charlie Brown Christmas. 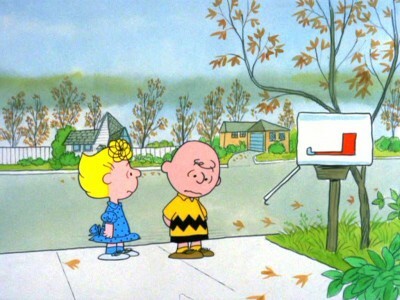 Both feature Charlie Brown fretting about an upcoming, depressing holiday. He then has to (ineptly) provide or produce some kind of event in conjunction with the holiday (the play and the tree in Christmas, an impromptu dinner here)—an event that of course falls short, thus ticking off the gang (Lucy is the main complainer in Christmas; here, it’s Peppermint Patty). Then, with Charlie Brown at his lowest, he’s given a pep talk by one of the quieter characters (Linus in Christmas, Marcie here) who explains the real reason for the season, and lifts his spirits. Except for some minor differences here and there, they could be the same cartoon. Which is fine, if A Charlie Brown Thanksgiving could at least hold its own with the beautifully modulated, surprisingly emotional A Charlie Brown Christmas. 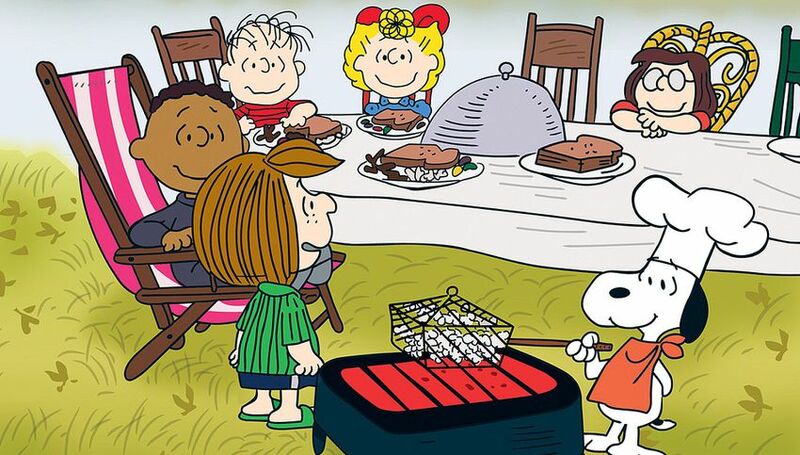 While Schulz’s patented cruelty towards the forever shat-upon Charlie Brown is on display again for Thanksgiving (not only do his friends invite themselves over, but then they have the nerve to complain about the food he serves them), the motivation seems thin and arbitrary. In the Christmas special, the children razz Charlie Brown constantly, but when he brings that admittedly pathetic tree to the play, that’s their cue to really lay into Charlie Brown. Of course they can’t see the cruelty in what they’re doing (what little kid does? ), but they eventually understand how truly kind Charlie Brown is, deep down. In Thanksgiving, however, the basic premise of Patty inviting herself and the other kids over to Chuck’s seems a small, forced plot device (to further bolster the thin premise, a parent’s okay is thrown in by Patty when she speaks to Chuck over the phone—a story crutch that seems strangely out of place in the normally adult-less Peanuts world). Her outraged reaction to a meal that most little kids would probably love (popcorn, jelly beans, pretzels, toast (? ), and some kind of ice cream drink) seems calculated only to follow the pattern of abuse/redemption that was established in Christmas. Christmas was artfully simple in letting the audience discover for themselves that Charlie Brown’s concern for the little tree was the only true expression of the real Christmas spirit. A Charlie Brown Thanksgiving, however, clumsily insists on Marcie spelling everything out for the audience with her literal dressing-down of Patty’s rude behavior and her obvious declaration of Charlie Brown’s essential goodness. Even worse, Christmas delivered a small but powerful emotional wallop with Linus’ direct declaration of what the Christmas holiday is really about, when he quotes the Bible. Thanksgiving’s botched kids’ dinner conveys none of the simple blessings that are inherent in our own uniquely American holiday (nor certainly any of the religious aspects, either—another mistake). 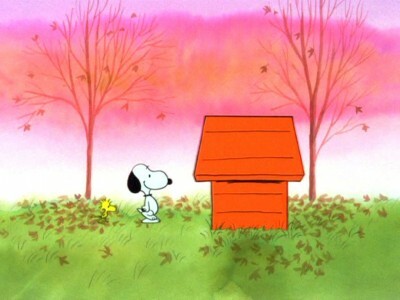 Still…whenever Snoopy is on in A Charlie Brown Thanksgiving, the film picks up considerable energy, and he’s more than enough to push the short into the plus column. The Snoopy craze of the early 70s was really peaking at this point, so it’s not surprising he has a much more central role here than Charlie Brown. 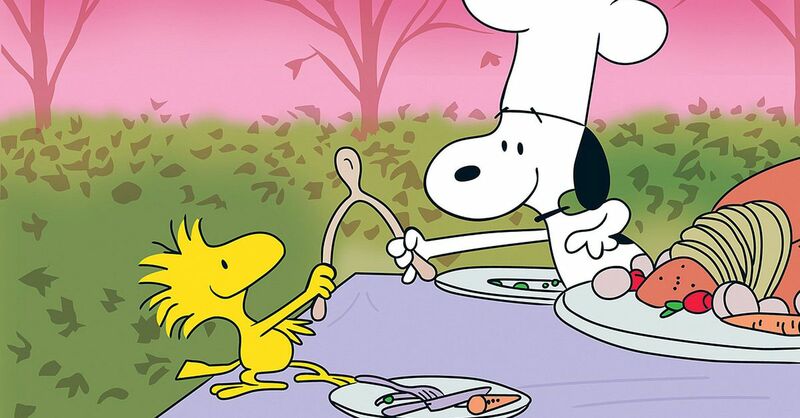 Snoopy’s centerpiece sequences, including the fight with the folding lawn chair and his efforts to make toast and popcorn, never fail to get the kids laughing, while the short’s final “gotcha” gag—Snoopy and Woodstock had a huge turkey and pumpkin pie in his dog house all along, while poor Charlie Brown suffered—fits in nicely with Schulz’ essentially pessimistic world view (and yes, that would extend to Woodstock being, essentially…a cannibal). Finally, despite the drawbacks of the toon’s script, it’s impossible to dislike A Charlie Brown Thanksgiving when Peanuts composer Vince Guaraldi lays down some sweet, mellow autumnal sounds (Thanksgiving Theme is lovely), along with the decidedly un-Thanksgiving-sounding Little Birdie, a funk groove that comes out of nowhere and almost lifts the short up with the best of the Peanuts classics.